November 11, 2011 May 31, 2012 Nefer Khepri, Ph. D.
Card of the Day for 11/11/11: The 9 of Water! Well, would you look at this! You won’t believe me, I know, but I did choose this card completely at random without looking at the deck, I swear it! Here we are finally at the pivotal date in the earth’s history: 11/11/11 and what card comes to us for today? The 9 of Water, which in other tarot decks is the same as the 9 of Cup…s, otherwise known as The Wish Card! I’m excited, aren’t you??? Today’s THE day and here we have the Wish Card to greet us for today. The 9 of Cups represents fulfillment, plenty, abundance, and yes, it can indicate over-indulgence at times (overeating or drinking too much are two examples). Look at the image on this card for a second. You see how the woman here is standing within a dark cave. 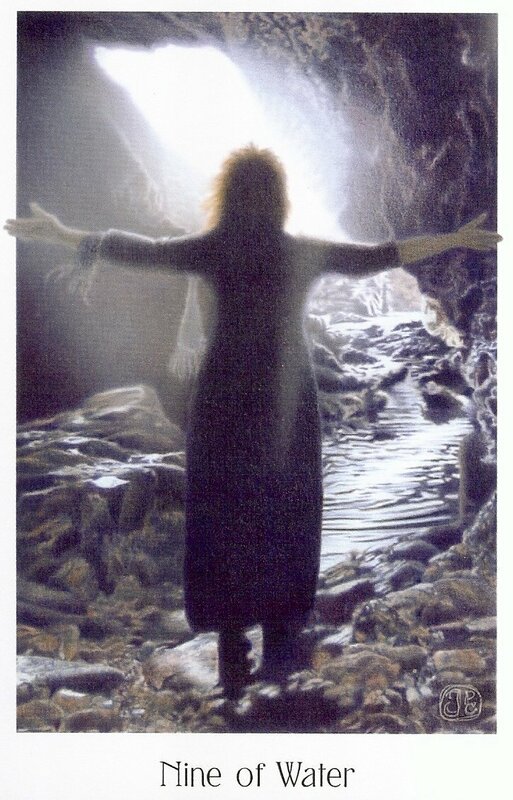 She faces the cave’s entrance and sees all the light streaming in. She opens her arms to receive this light. This is amazing because, according to Archangel Michael (you’ve seen his message for today here earlier this morning) this is exactly what you’re supposed to do today. Open yourselves up to receive! The 9 of Cups usually indicates that there are super wonderful energies surrounding you now and that now is the time to focus on wish manifestation! How to do this ~ a simple exercise for today and today ONLY as it is 11/11/11. This is something I’m doing myself in about an hour since I’m in CST zone & so 11:11 AM for me is just under 2 hours away. Get pen & paper. Make a list of your fondest wishes. They can be big or small. The only requirement is that they be important to you. Write them down. They do not have to be in order of preference so you can list them as they occur to you. When you’re done you can get a candle if you want or some incense, that’s up to you. You can do this either at 11:11 AM/PM your time or any time today, but no later than 11:11 PM your time. Face east, the direction of the rising sun. In most ancient cultures the east is the direction from which blessings flow to us because that’s where the sun has always risen and the sun brings light and life to our planet. Enter into prayer or focused thought. Direct your thought to your higher power, whomever or whatever that may be, or if you don’t have one, just address the universe, that’s fine. Anything today will work because the energies that are coming through are universal. Be specific. The more specific you are with the wording of your wishes the more likely it is you will receive exactly what you ask for. List time frames, as in the example above. This way the universe knows that it has only up to 3 years to grant me my wish for that trip to England (one of my actual wishes, by the way). Once you’ve read your list, re-read it, but this time preface EVERY wish with the phrase, “Universe/God thank you for granting me my wish of . For example, for me one would be, “Universe/God, than you for granting me my wish of traveling to England with my husband & daughter sometime in the next 2 – 3 years.” Do this for every wish on your list. Then you’re done. If you’re using a candle for this, cleanse your candle of any unwanted energies it may have picked up in manufacturing, shipping, or sitting on the store shelf (unless you’ve made it yourself, then none of this is necessary) by rubbing from the middle out to both ends, including the wick. Imagine gray smoke leaving your candle. Your candle may get warm or it may tingle or even feel lighter in your hands than when you first picked it up. Then, focusing on your name & date of birth, place your energy into the candle by rubbing from both ends toward the middle, don’t forget to include the wick. Do this 3 times, at least, or until your candle feels “right” to you. It may again get warmer or tingle or even feel heavier because you’re placing energy into it. Light the candle prior to reading your list and place your list under the candle (be SURE the candle is in a SAFE candle holder appropriate for the size and shape of the candle you’re using! ), and allow the candle to burn itself out. When it goes out if there’s any wax remaining you can bury it somewhere on your property or if you rent and have plants, you can bury it in one of your plants. Let’s all go out today and focus on making our fondest wishes come true!